What would happen to America after a nuclear war? 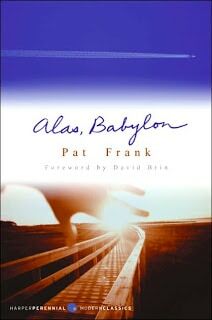 Alas, Babylon gives us some idea with a 1950s perspective. This book ripped me apart. I loved it but it terrified me. I found myself wanting to hoard food, water, sewing needles and just about everything else while I was reading this book. The book, written in 1959, is about a group of people living in a small town in Florida after almost every major city in America has been destroyed by nuclear war. Russia and America are both destroyed and the scariest thing about it is that the war basically only lasted one day. This book shows the country go back to a bartering system. People are fishing and gardening to survive and there is no electricity. This book made me realize how much of the stuff we have scrimped and saved for would be worthless to us if something like this were to happen. What good is your TV if there is no electricity or television broadcasting? In the book, all the diabetics die because there is no refrigeration for their insulin. It broke my heart to see so many people die. In the book America went from a society with fabulous medical technology and saving many lives, to survival of the fittest in just a matter of days. Getting past the terror this book instilled in me, it was fabulous. I loved the characters and was sad when the books was over. I loved the small society that they set up and the things they did to make it through. I almost wanted to be a part of their society. Almost. In some of the reviews I have read of this book, a lot of people hold the same complaint. One of the families in the book is African-American and some readers felt the other characters were racist towards them. I felt like they might have been in the beginning but as nuclear war levels the playing field they begin to realize that racial differences don’t matter like they thought they did. Keep in mind the book was written in 1959, a period of racial struggle in America and I think you will understand some of the inferences better. I am not proud of some of the racial inequalities our country has had but I feel to take them out of our literature would be to forget it ever happen and allow it to happen again to someone else. Who won the war? You are going to have to read it to find out but does it really matter? Both countries are destroyed and most of their populations have been killed, would it really matter who won?